I've lived here for going on 3 years and the longer I'm here, the better it is! I love everything about this complex: the people are friendly, the staff is extremely helpful, and the area is great! Darien, we are glad that you have been here for 3 years! I hope there is many more years to come. We strive to be as helpful as we can. Customer service is our #1 goal. You come first. As long as you are happy, we are happy! Thanks for the review! We are close to everything! Thank you for the compliment on being great. 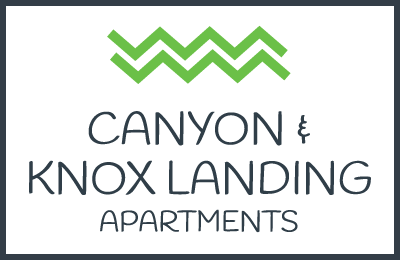 We are glad that you chose Canyon Knox Landing for your home! I’ve lived in several different communities here in Knoxville. But I have to say, this place is just the best. The staff is extremely friendly and understanding. The units are properly maintained and bug free! It’s so quiet and cozy. I love living here at the Landing! We appreciate the review. I am so glad that you chose Canyon Knox as your new home. We take pride in our community and strive to be the best staff that we can be. Thank you again! Great place to live. Very close to town. Lots of amenities. They are very pet friendly which is huge for me. Apartments are affordable and super updated! Staff and maintenance are fantastic! Thank you for your review. Be sure to check out our or may I say your new Dog Wash. The Dog Wash is in the process and should be up and running by the end of the year! Cute area in North Knoxville. Large pool & clubhouse. Dog park is the largest I've seen for being on-site with night lighting & waste removal. There is also a dog wash station going in soon! Friendly maintenance staff that is attentive. Ken, thank you for the awesome review. We do have a very attentive maintenance staff. They get your maintenance requests done quickly. The Dog Wash Room is underway. Exciting amenities are ahead! I LOVE living here! The staff is so friendly and helpful. Anything you need is taken care of super quick and always with care. The Knox Landing building feels just like little cottages, I forget I live in an apartment complex all the time! Kaitlyn, you are exactly right about Knox Landing. It is like your own little cottage. We have the best maintenance team to take care of your apartment needs quickly. Residents come first. Happy residents makes happy living! Thank you for the review! Thanks Ashley! I am happy that you enjoy living here. Yes, we are always adding new things. Our new Dog Wash is in the works. If you have any suggestions on how what you would like to see as a new amenity or a new event please let us know. Thanks Chasity for the great review and we are so super happy that you chose to call us home, AGAIN!!!!! I'm enjoying my time here! Nice apartment, quite community and maintenance is the bomb! They go above and beyond! The walls are thick too not a lot of neighbor noise. Thank you so much for taking the time to give us a review! Yes, maintenance here is top notch and we appreciate their efforts tremendously! We are so glad that you are here and let us know if you need anything. Great community that is continually growing and becoming better. Wonderful staff and attention to detail. My first apartment experience has been incredible. Thank you for giving us a great review! It is really exciting to continue to watch the property evolve and some really awesome projects are about to begin!!!! We are so glad that you are here and chose to call us home. Thank you for the awesome review! We are so glad that you and your family call us home! Very friendly staff and lots of amenities on site! We love that our puppy is accepted and has been able to make so many friends in the dog park. Hey Madison, thank you for giving us a review! We are so happy that you guys decided to call us home as well as your pup! I told ya, the dog park is a great place for everyone as well as getting to know your neighbors. Hopefully you will be able to make it to the pet Halloween party and contest. Let us know if you need anything and welcome to Knoxville and for your new journey. Thank you Chuck for taking the time to give us a great review! We are so glad that you and your family chose to call us home. Let us know if you guys need anything, we will be there. The apartment is beautiful and the layout Is nice. I love the balcony and the landscape is gorgeous! The amenities are lovely. It’s nice to have a gym that isn’t just a treadmill and bike. The pool has been great too. It’s always clean. Thank you for so much for being part of our community! Our grounds are gorgeous for sure and love that we are a property with beautiful mature trees. The fitness center is pretty awesome and actually, a lot of the residents have dropped their gym memberships and saved that extra money. Thanks again for taking the time to give a great review! Great location, super helpful staff, friendly neighbors! Love everything about these apartments! I especially love that the staff are so friendly and helpful. Awww....thank you so much for the review! We are here to be at service for you and make sure that your living experience is top notch! We missed you at breakfast this morning. Next time! Great place to live...Very Quiet and can trust where I live.... Friendly staff that make you feel welcome! Maintenance is always quick to respond and thorough... I have no regrets about moving here! We are so glad and so excited that you came back to live with us here!!!! Home sweet home! Thank you so much as well for taking the time to give us a review, we really appreciate it! So far I love it here at The Canyon! The office staff is very helpful and if I have had any problems, they have been down quickly to solve the issue :) I am very excited to continue living here! I have absolutely no complaints about living here. Everyone is friendly and the staff is extraordinarily helpful. Been living here going on 3 years now and I've never had an issue that wasn't resolved almost immediately. Has it really been almost 3 years? Wow! Time really does fly by. So glad that you and your roommates are here, you guys ROCK!!!! I've only been here for a week and I already love this place. I've yet to experience everything the complex has to offer, but I know I will in due time. I do have one tiny issue that I plan on addressing to the staff when I finally have a free moment. I am glad that you love it here. I hope that you will enjoy our salt water pool on these humid days and be sure you check out our Fitness Center. Be sure you come by the office on Friday, August 3rd from 8:30 a.m. - 11:00 a.m. to fill up on some delicious waffles on our Waffle Bar. Please give me a call on your tiny issue. Our team would like to get that issue resolved for you. Thank you for your review! Great Community, Friendly Staff, well maintained landscape. Very convenient to restaurants, Grocery, and almost anything you may need. I 640 and I 75 easy to get to and get around town. Thanks Wayne for the review. We appreciate the compliment. I will pass along the compliment to the landscaping crew and our maintenance team. Customer service is what we strive for! We love having you as a resident. I absolutely love it here! The staffis super friendly and supportive! The neighbors are friendly and the property is beautiful. Maintenance is fast and friendly. The pool is always very clean as well and that's a big plus. My boyfriend and I are new here and we absolutely love it so far! This has been one of the smoothest move in experiences we've ever had. We're so glad to be here! Ashleigh, I am so glad that you and Darrell are here as well. Moving is so hectic that if we can do all the move in tasks for you, where all you have to do is show up then that makes it all smooth. Your apartment is beautiful and if you ever need anything we are always here. Refer some friends, we give referral fees!!!! Best apartments ever!!! Staff is super friendly and on top of every little detail. Plus the buildings layouts of Knox Landing are adorable!! Awww, thank you Kaitlyn, that means more then you know!!!!! We work so hard to make everyone feel like this is your home and we are just here to serve you. Knox is so adorable, that is why I have always referred to them as little dollhouses or cozy cottages because they truly are! I have loved every minute of care and patience that the staff here takes! Besides the friendly staff, the community is gorgeous AND quiet. I love the landscaping a lot. Thank you so much for the great review and taking the time to do so. The grounds here are gorgeous and everything is so green thankfully to all the rain we have received. We are glad that you decided to call us home and let us know if we can do anything for you. Nice, quiet place to live. Swimming pool a big hit with grandchildren. Maintenance and repairs addressed in a timely manner. Staff friendly and very helpful. Thank you Russell for taking the time to give us a great review! We are so glad that you are here and that the grand kids are enjoying the salt water pool. It is really nice especially in this crazy hot weather we have been having. Let us know if you need anything and we are at your service.